The Pick - Based on history you have to take the Eagles at +4.5. In Tom Brady's seven Super Bowl appearances, the Patriots have won five games by an average of 4 points (6, 4, 3, 3, and 3) points and in his two loses the Patriots lost by an average of 3.5 points (4 and 3). The Pick - Under! Both teams have shown flashes of offense in the playoffs and against great defenses. 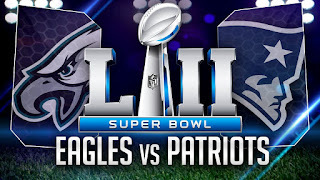 However both teams will be playing tight, Brady will feel pressure from the Eagles front 7, and the Eagles will not let Nick Foles sling the ball deep all over the field. It'll be close to 48.5 but won't quite get there. The Pick - My money's on Brady (-110). I believe the Patriots will win this game and he's won the MVP in 4 of his 5 Super Bowl victories. However if the Eagles win, I think we're looking at a defensive player and Fletcher Cox is my sleeper (+3300). The Pick - Tails! After the coin landing on heads in 5 straight Super Bowls, we've now seen it land on tails in 4 straight. It's also landed on tails in 5 of the last 6 Patriots appearances, which means....NOTHING. The Pick - James White (+1400). Somehow he did not win the Super Bowl MVP last year, despite setting a record by scoring 20 points for the Patriots. Brady and Belichick trust him in big spots, and he'll find the end zone first. Sleeper Pick - LeGarrette Blount. Yes, I truly believe the first touchdown will be scored on the ground. Blount may be taking a backseat to Jay Ajayi but he owns the touches inside the 10 yard line. He's going to be playing with a chip on his shoulder after the Patriots did not bring him back, and he'll be looking to run through people in Super Bowl 52. The Pick - Over! Brady has surpassed 286 yards in eight straight playoff games. Belichick wants the ball in Brady's hand as much as possible during Super Bowl's and he'll control the game. Anything under 300 yards would be a shock, and if the Patriots trail in this game, he'll be pushing 400 yards. Last year he was forced to throw the ball 62 times in the Super Bowl against the Falcons and finished with 466 passing yards. The Pick - Under! Despite a great game last week in the NFC Championship, the Eagles still do not trust Foles to take over a game, especially the Super Bowl. Expect a heavy ground attack by the Eagles in the first half, trying to limit Brady's snaps. Foles may be forced to throw the ball more often late in the game if the Eagles are trailing but 30 attempts should be his max. Who Will Record The Most Receiving Yards In The Game? The Pick - Danny Amendola (+700). There's no doubt it's going to be a Patriot. In his last 10 playoff games, Brady has attempted 50+ passes six times. Amendola is my pick. Last year Amendola recorded 8 catches for 78 yards and a touchdown. This year there will be no Julian Edelman, who saw 13 targets in Super Bowl 51. Expect a heavy work load for Brady's safety blanket. The Pick - Under! Only two tight ends surpassed 67 yards against the Eagles this season - Travis Kelce and Evan Engram. The Eagles do a great job at covering the tight end position and you have to imagine they're figuring out ways to slow down Gronk. The Pick - Over! So far through two games in the playoffs, Jeffrey has recorded 9 catches, 4 & 5 respectively. The Eagles gave him a 4-year deal to be the team's number one receiver, and they'll rely on him to make plays on the biggest stage. The Pick - Under! In three of his last four games, Ajayi has failed to reach 55 yards, despite having 12+ carries in those games. The Patriots do a great job at stopping the run, especially with their second half adjustments. Last week they held Leonard Fournette to just 36 yards on 12 carries after halftime. Ajayi will also lose touches to Blount and Corey Clement. The Pick - Longest Reception! (-170). Yes we have two of the best kickers in the game with super strong legs going head to head, but we also have two of the best deep ball threats in Brandin Cooks and Torrey Smith. Long field goals might be passed up as teams don't want to give the opposing team great field possession with a miss. Will The Eagles Have A Rushing Touchdown? The Pick - Yes! (-170). If the Eagles get inside the 10 yard line, it's almost a sure bet they'll try to pound it on the ground with Blount. He'll eventually bully his way into the endzone. The Pick - Over! In there two playoff games, the Patriots have 53 first downs while the Eagles have 49. Both teams will take less chances down the field, leading to more 5-8 yard passes leading to first downs. This will lead to more first downs. What Team Will Kirk Cousins Play For In 2018? The Pick - Browns! There is no team that is more desperate for a franchise quarterback than the Cleveland Browns. How many QBs can they waste a first round draft pick on because they can't spot good talent? Cousins has proven himself in this league, and would be a perfect fit with the Browns. He already has some good weapons in Josh Gordon, Corey Coleman, David Njoku, and Duke Johnson. If the Browns can sign Cousins, they can take Saquon Barkley with the first overall pick, and use their number five pick to address other needs. Despite going 0-16, the Browns could be somewhat decent with a real quarterback and a few added pieces to their defense led by Myles Garrett.